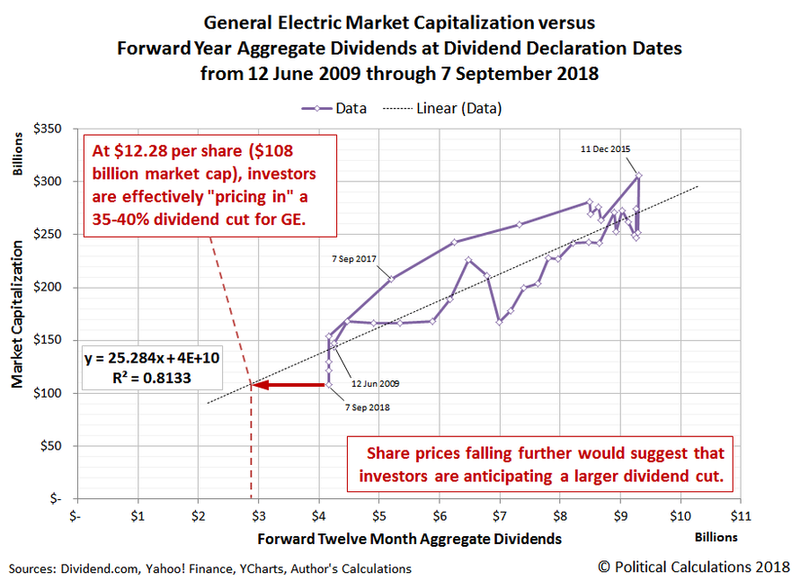 It's been several months since we last considered the deteriorating situation for the future of dividends at General Electric (NYSE: GE), where we wrote that either GE or its dividend, and quite possibly both, were set to shrink. Four months and one CEO later, and that statement holds even more true today, where we believe that it is no longer a question of "if", but of "when" and "by how much". On 12 October 2018, GE announced it would delay the release of its fourth quarter financial statements until the end of the month to allow the company's new CEO, Larry Culp, to complete his "initial business reviews and site visits". At the same time, we're coming up on the one year anniversary of when GE's then new CEO, John Flannery, slashed its quarterly dividend in half, from $0.24 per share to $0.12 per share, so it's a good time to look at what's changed for investors, which we can do by looking at just one number: the company's market capitalization. When GE declared its last quarterly dividend of $0.24 per share on 7 September 2017, GE's market cap was nearly $208 billion. Exactly one year later, when declaring its fourth quarter dividend payment for 2018, GE's market cap was $108 billion, which is pretty close to where it stands today, just over a month later. That missing $100 billion goes a long way toward explaining why GE now has a new CEO. That decline also gives us an indication of how much GE's new manager may be looking to cut the company's dividend. The following chart shows the relationship between GE's market cap and its aggregate dividend payouts for each quarter since 12 June 2009. Given the historical relationship captured in the chart, at GE's current day market cap of $108 billion, we would anticipate a 35-40% reduction in the size of the company's dividends, from $0.12 per share to about $0.07 per share, which for all practical purposes, is already baked into the company's average share price over the five weeks. Culp could announce this change today and there would be minimal impact to the company's stock price. But, that 35-40% lower dividend payment is for a General Electric that still has its health care division, which it has been planning to spin off. Without it, GE will need to cut its dividend by more than that percentage, because it won't have the revenues, earnings, and cash flow that it provides to the company to sustain a dividend reduced by only 35-40% from today's level. We think then that it's very likely that once the new CEO's review of the company's operating and financial situation is complete, GE will suspend its dividend altogether. The change would help preserve what has been the company's increasingly distressed cash flow, which some analysts have indicated is not sufficient to cover both GE's current quarterly dividend of $0.12 per share and its operating requirements. Other analysts believe that GE's dividend is safe. Based on the information we have today, we are not in that camp.